Do you plan on celebrating Valentine's Day? If so, how? 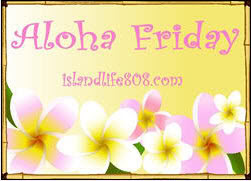 For more Aloha Friday fun stop by An Island Life. Yes,we do. Dinner and something special. yes, but not sure yet :) I think hubby and I will go out the Saturday before and then have dinner with the kiddos Sunday with a fun red/pink theme. Yes but I don't know how yet. I'm thinking movies. I will get the kiddos some candy and maybe small stuffed animals, and for the hubby....make a special dinner. That's about it, though. I plan on doing lots of laundry since we will just be back from a week at Disney World. My husband took of for Valentines Day and that is our anniversary. I really don't know if we will celebrate as it's hard with 3 kids and no baby sitter. we'll celebrate to some degree, but no major plans yet. we'll probably go out on friday night for dinner. We are not planning on doing anything. We usually just get take-out from our favorite restaurant.